Catechism courses were offered every week to the Knights of Mary so that our beautiful Catholic religion and the teachings of the Church may be better known and understood. 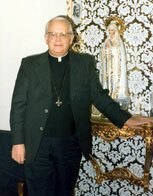 You will find reproduced here a few recordings of the courses given by the late Father Philippe Roy at the Center of the Immaculate between 1976 and 1988. © 2003 - 2018 All right reserved: La Communauté de la Dame de tous les Peuples Inc.